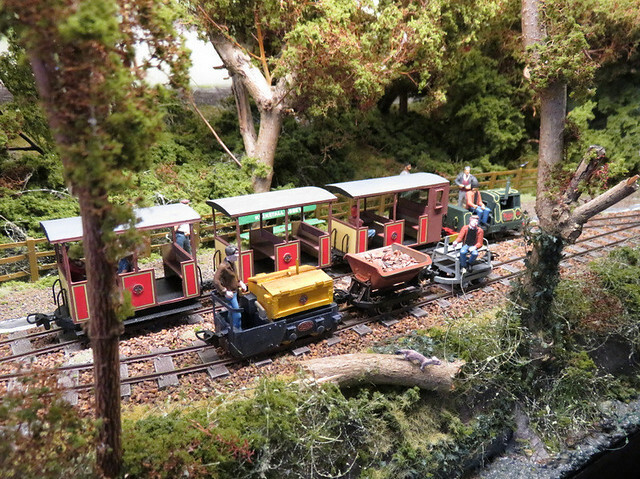 Last Saturday I headed over to Bognor to the SWING exhibition, which has now established a reputation for having a good selection of industrial and narrow gauge layouts. 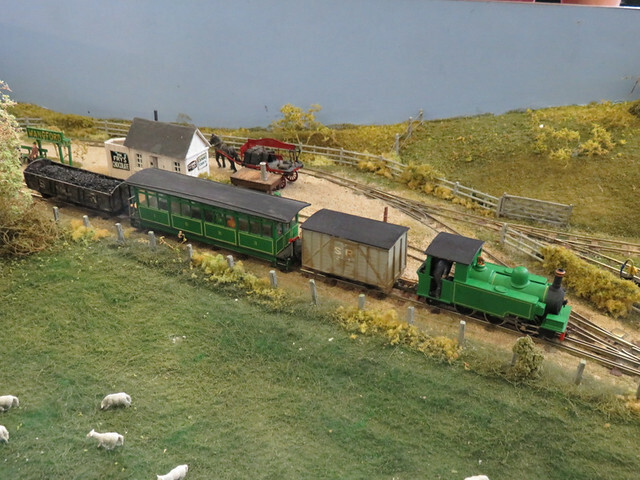 Though I think it has struggled to keep the same small and friendly feel in the larger venue, it has allowed more layouts - and bigger ones too, such as the live steam 16mm scale. Strangely I still like the small ones best though, like Compass Point by Chris O'Donoghue in 009. It packs in a lot of detail in a small space, and achieves that atmosphere that is impossible to define. Chris Ford and Nigel Hill's ultra-simple and quite different Morton Stanley is also full of atmosphere, following the "less is more" route in 7mm scale. 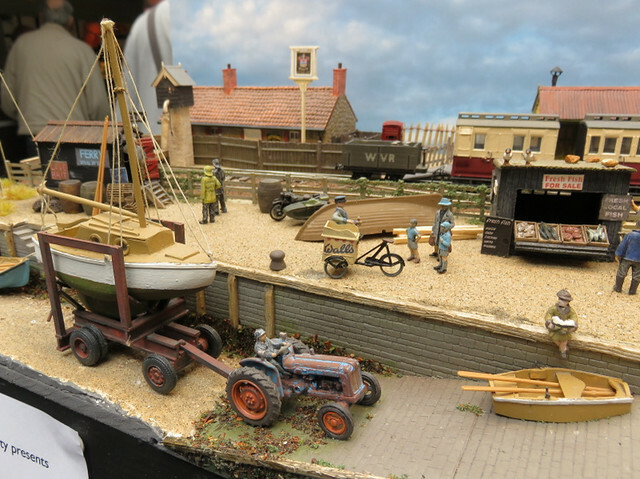 Portwenn is a delightful 7mm scale layout with an attractive quayside, now in the new ownership of Simon King I hope it gets to more exhibitions. 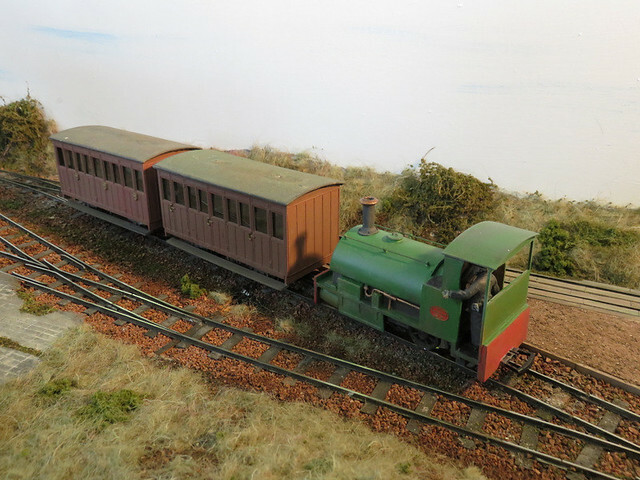 Simon Wilson brought Wangford, just part of his Southwold Railway layout in 009. As this board is normally at the back of the layout it is nice for it to be more visible, and the simple set-up with a fiddle yard each end allows a procession of trains through the station. Those are just a few of my highlights - you can see more photos here. 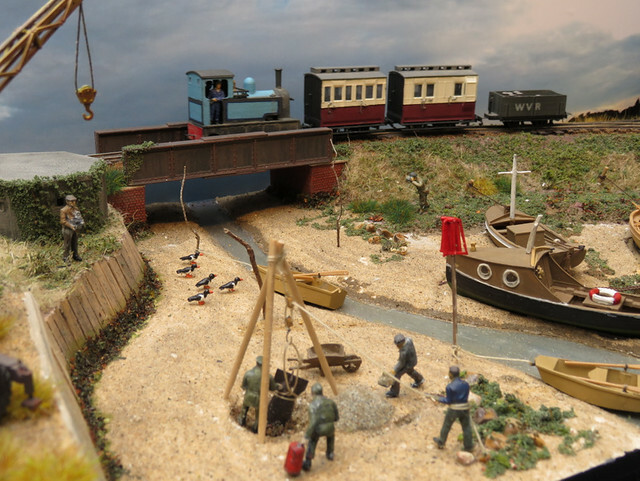 Trade support was good too, with some narrow gauge specialists as well as both the 7mm NGA and 009 society sales stands. Not that I got much time to browse with my Son nagging, however he really enjoyed making a tree for his layout as guided by a very patient chap on one of the demo stands - a nice touch - and the ride-on train too. Branded Keykits I guess it's pretty old, but it looks like a Wrightlines motor bogie, which is currently unavailable (like much of the Wrightlines range, sadly). 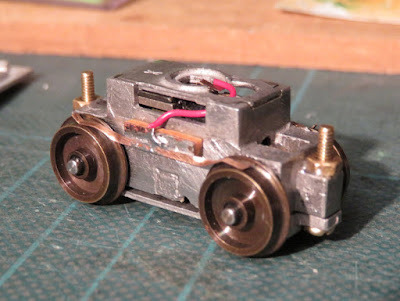 It's essentially a Tenshodo motor bogie replacement, but with a Mashima motor mounted with it's widest dimension vertical to allow the wheels to be pushed in to 14mm gauge - very useful given the number of 7mm scale kits that utilise the Tenshodo unit. 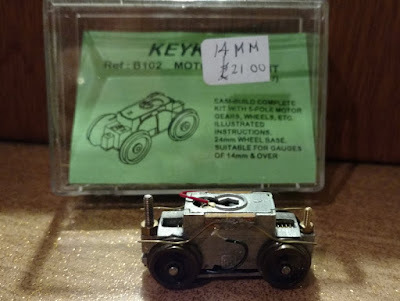 This one had crudely fitted pick-ups, mismatching bolts and a broken wire - but the motor turns when it got power. It didn't take long to dismantle. I checked and adjusted the wheel back-to-backs, and found some M2 bolts that were a good fit - the nuts are secured with Araldite. 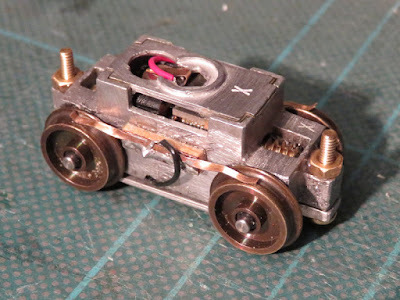 I moved the PCB down away from likely body fitting and closer to the wheels, and attached new pick-ups from phosphor-bronze strip - which I find much springier and more effective than wire. With the motor refitted, wires reattached, and keeper plate bolted in place the unit was running. Now I know these things can be a little fast, with relatively high gearing, but a few lumps of whitemetal on top slowed it a little. The motor seems to run quite hot too, I don't know if it could do with more airflow. However it dos occasionally stop at low speeds, seemingly at the same spot, and I think more of a mechanical bind than pick-up issues - though I can't see anything wrong with the gears. I'm hoping some running in will help.